President Sein: I would like to welcome you to our capital and I know The Washington Post is a renowned newspaper in America. This is the first time to meet with the foreign media. This is our foreign minister, our minister of information and our minister of labor. Q: The West has been watching the changes you have brought about in your country — the freeing of political prisoners, enabling Aung San Suu Kyi’s party to run in the upcoming April election and the cease-fires you’ve declared with some of the ethnic groups. You have made extraordinary changes in a short time. What motivated you to want to change your country and to start this reform process? A: With regard to the reform process we are undertaking in our country, there is a lot of encouragement from our people. The reform measures are being undertaken based on the wishes of the people [who want] to see our country have peace and stability as well as economic development. To have internal peace and stability and economic development, it is important to have good relations with the political parties that we have in our country. That is why we have had engagement with Daw Aung San Suu Kyi. In my meeting with Daw Aung Sang Suu Kyi, we were able to reach an understanding between the two of us. People would like to see peace and stability and that is why we have had engagement with the ethnic armed groups. That’s why our reform process is based on the wishes and the will of the people. The people could not had this reform process without your leading it. 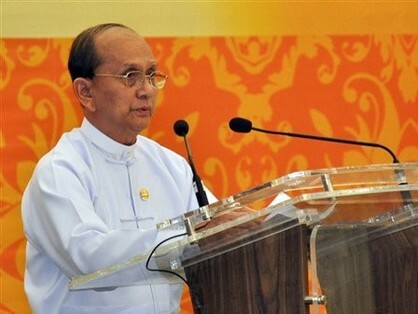 You decided to release the political prisoners, you met Aung San Suu Kyi. . . . What is next? Will you continue with this pace of reforms? With regards to our future perspectives, we’d like to see transparency. I hope that we can and will be able to maintain friendly relations with countries of the world. Can you share with us what is next in the reform process? What your vision is? I believe that you need to know our aims, and they are to have peace and stability and economic development in our country. For the future, we need to continue to take necessary actions to achieve these goals. You have normalized relations with the U.S., you have released political prisoners and achieved cease-fires with some of the ethnic groups. Do you have a definite next step? The parliament also made amendments to the election commission law so that Aung San Suu Kyi can contest the upcoming by election [April 1]. 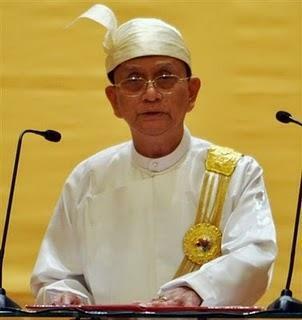 Now, The National League for Democracy — her party, the NLD — has registered as a political party, and Aung San Suu Kyi will be contesting the upcoming by-election. If the people vote for her, she will be elected and become a member of parliament. I am sure that the parliament will warmly welcome her. This is our plan. Another thing I would like to shed some light on is the ethnic armed groups we have in our country. First of all, we need to build confidence between the two sides. We have reached agreements on certain things. This requires the two sides to sign an agreement and return to the legal fold without carrying arms. You made a cease-fire with the Karen group. There are a total of 11 armed groups in our country. We have engagement with all the armed groups. We also have agreements with some of the ethnic armed groups. But this is not over yet. We are continuing negotiations. What did you mean when you said they should return to the legal fold? Is that after reaching an agreement with the government? This is based on the agreement between the two sides. Soon we will try to achieve an eternal peace in the country. However, this will require time. If she does well in the upcoming election, would you think of giving Aung San Suu Kyi a cabinet post? It depends on the elections and if she was voted for by the people or not. Once she has been elected, she will become a member of parliament. All of the cabinet ministers that we have now are appointed based on the agreement given by the parliament. Would you like to see her become a cabinet minister? If one has been appointed or agreed on by the parliament, we will have to accept that she becomes a cabinet member. What is your vision for U.S.-Myanmar relations in the future? What are your hopes for that relationship and how would you like to see it evolve? 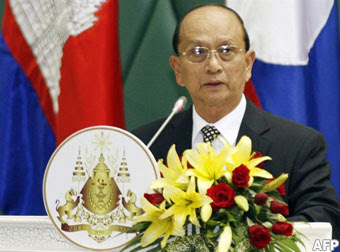 With regard to U.S.-Myanmar relations, I would like to make three points. First, we already have engagement with the United States. Secretary of State [Hillary] Clinton visited our country and just today we were visited by Senator Mitch McConnell. The second point is that we are not represented by [diplomats at the] ambassadorial level. We hope the representation can be upgraded. The third point I would like to make is that the U.S. and the E.U. have had economic sanctions on our country. It has been [for] nearly 20 years now. I would like to see them ease . . . and eventually get rid of the sanctions. . . .
Secretary Clinton announced last week that relations would be normalized and that the U.S. and Myanmar will exchange ambassadors. Yes, I have heard that news also. Until today it has not been announced that there has been an appointment of an ambassador. There are three requirements that Western countries would like to see us do. First is the release of political prisoners. Second is to hold the [parliamentary] election. 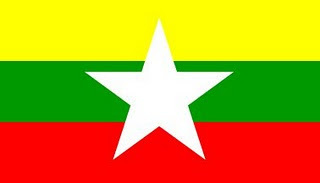 Thirdly, to have Aung San Suu Kyi and others participate in our political process. I believe we have accomplished these steps already. What is needed from the Western countries is for them to do their part. In taking actions with regard to the three points I have mentioned, we have done it not because others were putting pressures on our country. We did it because we felt it was necessary to do for our country. It was not [Your reforms were not motivated by] because of the pressure from the sanctions? Didn’t sanctions work? Sanctions were aimed at harming our government but, actually, they harmed the interest of our people. Nor did they affect the previous government, which actually laid down the procedures so they could hand over a democratic system for our country. You are speaking about the seven-step program outlined in 2004? The previous government laid down the seven-step program so they could implement a democratic system in our country. They have taken the necessary measures step by step. They laid out the program so they could implement democracy? People are wondering, why are you reforming now. Your answer is that this was planned a long time ago and it has been moving along in stages? When a system needs to be changed, it cannot be done overnight. Some countries that have tried to change overnight have deteriorated. That is why we laid down the seven-step road map and have taken step-by-step measures. You can see we are a democratically elected government. But 25 percent of the government is reserved for the military, and most of the members of the government, including yourself, are former members of the military. Democracy to us means a civilian government that has power over the military. The military is no longer involved in the executive body. Even if you look at our parliament, one-fourth is reserved for the military. We cannot leave the military behind because we require the military’s participation in our country’s development. The U.S. perspective would be that you have to have a strong military but the civilians have to have the power. Our president is more powerful than our chief of staff of the armed forces. That to us is democracy. So how far can you take this reform process? I hope that you can study our constitution. [Under it] the president has to appoint the commander in chief of the armed forces in our country, too. The U.S. is also concerned about your relationship with North Korea. Senator [Richard] Lugar recently stated that your country might be developing a nuclear program with the help of the DPRK. Could you comment on this? Are you willing to sever military ties with North Korea? We have diplomatic relations with the DPRK [but] we don’t have any relations with regard to a nuclear program or military cooperation. These are only allegations. In the international arena, our country is one that stands for the nonproliferation of nuclear weapons. We have always abided by the resolutions of the United Nations and these are only allegations. We don’t have any nuclear or weapons cooperation with the DPRK. The DPRK is not in a situation to provide assistance to our country, and we don’t have the financial means to implement a nuclear program. Are you willing to let IAEA [International Atomic Energy Agency] inspectors into your country? We are in the process of signing the additional protocol of the IAEA. This requires a study, which has to be submitted to our parliament for approval. Is there anything you would like to say to American readers? My message is that we are on the right track to democracy. Because we are on the right track, we can only move forward, and we don’t have any intention to draw back. Our government is only about nine months old.In terms of democratic experiences and practices, we still have very little experience and practice. I don’t think that we can compare with the United States — a country that has been practicing democracy for over 100 years. For democracy to thrive in our country there are two main requirements. First is to have domestic peace and stability. Second is that we need economic development and we are taking necessary measures for our economy to develop so our people will have a better livelihood. . . . About 3 million of our people are working in other countries. We have about a 26 percent poverty rate. That is because for over 20 years sanctions were placed on our country. Sanctions hurt the interest of our people. For that reason, there were no job opportunities in our country. If you would like to see democracy thrive in our country, you should take the necessary actions to encourage this by easing the sanctions that were placed on our country. If you want to build up your economy and develop it, would you be willing to privatize some industries and let foreign investors come in? We welcome foreign investors and we have made necessary amendments to our law as it relates to foreign investment. But foreign investors will only come once sanctions have been eased up on our country. But investors will ask for rule of law and for courts. I don’t think there are any difficulties for foreigners to make investments in our country. The only difficulty they [would have] is sanctions. Are you willing to allow a free media in this country, to abolish the 1962 media law, allow daily papers to be published and also allow for private ownership of the media? With regards to freedom of the media, you can see that it is not like it was before. We have a daily journal published in our country and [the media] can express freely in the paper. However, we still require democratic practices. The media needs to take responsibility and proper actions. Media freedom will be based on the accountability they have.